↑ Rappé MS, Giovannoni SJ (2003). 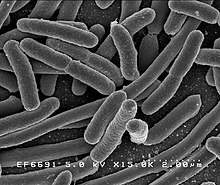 "The uncultured microbial majority". Annu. Rev. Microbiol. 57: 369–94. PMID 14527284. डीओआइ:10.1146/annurev.micro.57.030502.090759. ↑ Sears CL (2005). "A dynamic partnership: celebrating our gut flora". Anaerobe. 11 (5): 247–51. PMID 16701579. डीओआइ:10.1016/j.anaerobe.2005.05.001. ↑ "2002 WHO mortality data". अभिगमन तिथि 2007-01-20. ↑ Porter JR (1976). "Antony van Leeuwenhoek: Tercentenary of his discovery of bacteria". Bacteriological reviews. 40 (2): 260–269. PMID 786250. ↑ van Leeuwenhoek A (1684). "An abstract of a letter from Mr. Anthony Leevvenhoek at Delft, dated Sep. 17, 1683, Containing Some Microscopical Observations, about Animals in the Scurf of the Teeth, the Substance Call'd Worms in the Nose, the Cuticula Consisting of Scales". Philosophical Transactions (1683–1775). 14: 568–574. अभिगमन तिथि 2007-08-19. ↑ van Leeuwenhoek A (1700). "Part of a Letter from Mr Antony van Leeuwenhoek, concerning the Worms in Sheeps Livers, Gnats, and Animalcula in the Excrements of Frogs". Philosophical Transactions (1683–1775). 22: 509–518. अभिगमन तिथि 2007-08-19. ↑ van Leeuwenhoek A (1702). "Part of a Letter from Mr Antony van Leeuwenhoek, F. R. S. concerning Green Weeds Growing in Water, and Some Animalcula Found about Them". Philosophical Transactions (1683-1775). 23: 1304–11. डीओआइ:10.1098/rstl.1702.0042. अभिगमन तिथि 2007-08-19. ↑ "Pasteur's Papers on the Germ Theory". LSU Law Center's Medical and Public Health Law Site, Historic Public Health Articles. अभिगमन तिथि 2006-11-23. ↑ "The Nobel Prize in Physiology or Medicine 1905". Nobelprize.org. अभिगमन तिथि 2006-11-22. ↑ O'Brien S, Goedert J (1996). "HIV causes AIDS: Koch's postulates fulfilled". Curr Opin Immunol. 8 (5): 613–618. PMID 8902385. डीओआइ:10.1016/S0952-7915(96)80075-6. ↑ Thurston A (2000). "Of blood, inflammation and gunshot wounds: the history of the control of sepsis". Aust N Z J Surg. 70 (12): 855–61. PMID 11167573. डीओआइ:10.1046/j.1440-1622.2000.01983.x. ↑ Schwartz R (2004). "Paul Ehrlich's magic bullets". N Engl J Med. 350 (11): 1079–80. PMID 15014180. डीओआइ:10.1056/NEJMp048021. ↑ "Biography of Paul Ehrlich". Nobelprize.org. अभिगमन तिथि 2006-11-26. ↑ Schopf J (1994). "Disparate rates, differing fates: tempo and mode of evolution changed from the Precambrian to the Phanerozoic". Proc Natl Acad Sci U S a. 91 (15): 6735–42. PMC 44277. PMID 8041691. डीओआइ:10.1073/pnas.91.15.6735. ↑ DeLong E, Pace N (2001). "Environmental diversity of bacteria and archaea". Syst Biol. 50 (4): 470–78. PMID 12116647. डीओआइ:10.1080/106351501750435040.